The night was completely dark and quiet except for the sounds of deer moving about in the shadows. Suddenly, there it was. 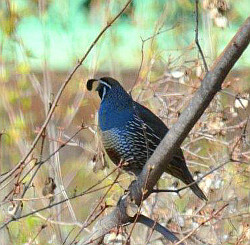 Outside of the odd post-party morning, most of us here don’t usually see things like this. This was real. Other creatures walking about in the night knew it, and kept their distance. Scary! . . . Until a soft voice spoke out: “I’m wearing the blue lights so I don’t get run over”. Hello? I’m sure I saw several cars drive into the ditch. You’re not going to get run over! Who are you? Coalmont Energy also has a bus, but unlike the local BC Transit one it gets a lot of use here. Most of the 12 seats are occupied on each trip. There are probably many of you who do not know that we exist, but we are a conversion company based out of British Columbia Canada. We have been around since 1979, and have been doing conversions since the mid `80s. Original development was based on a need for crew vehicles, ambulances, buses and other vehicles of such to be able to handle the winters in a more capable way. This vehicle is a recent acquisition by the mine, but the idea was first mentioned a long time ago when Steve Dimond came to talk to our community. With the number of employees planned, there was a concern about the amount of traffic going up the Blakeburn Road. Now that the mine is up and running the bus has become a necessity. It saves wear and tear on the road, and makes travel safer because of the reduced traffic. This is also environmentally preferable to having a couple dozen employee’s trucks putting on the miles. The bus makes two round trips per day as it picks people up and drops them off after each shift. 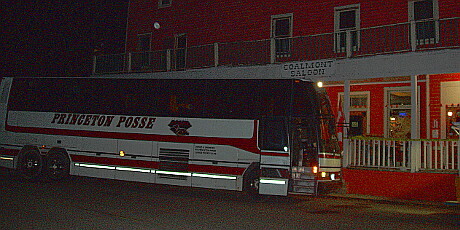 The first trip starts in Princeton at about quarter to 6 in the morning and you’ll see it stop in Coalmont. Here you see the Clyde on Parrish as the workers are making the homeward journey after the first shift. The Coalmont to Princeton bus rides on Fridays only. There needs to be two or more passengers and the trip must be booked in advance. Ideally one should call two days ahead but the day before could be sufficient – depending on what the driver already has booked. Pickup is in front of the Coalmont Hotel at 9 a.m. and the return trip will start 3 p.m. at the Cooper’s Foods parking lot in Princeton. Is that for real? Almost, but not quite. Well . . . sort of. You can find the Princeton and Area Transit System on the net and see the “Welcome Aboard!” message and “Everything you need to know about using the public transit in Princeton and Area”. Navigate to fares http://www.transitbc.com/regions/pri/fares/ and there it is: Cash Fare: One Way – Princeton to Coalmont – $3.00. You can get transit information by calling 250.295.6666. As of this writing, a schedule was not available, but we will publish it here as soon as it arrives. Funding for the service is cost shared among the Town of Princeton, the Village of Keremeos, the Regional District of Okanagan-Similkameen and BC Transit. Decisions about fares, routes and service levels are made by the Town of Princeton based on information and planning provided by BC Transit. The transit system is operated by Princeton & District Community Services. As one would expect for such a thinly populated area, the service is quite limited. In fact, you have to call ahead and make an appointment. The real kicker in our situation is that they will not come out here unless there is a minimum of two people. That generally makes it impossible to use for doctor’s appointments though it would work for someone in a wheelchair who travels with a companion. There is nobody like that in Coalmont at the moment, but it could happen. The fact is that it is really a non-service, and for BC Transit to claim that there is a bus to Coalmont is confusing at best, and perhaps a little misleading. It is possible that this could change. BC Transit is currently running a program to determine what they can do to meet the future. The Transit Future Plan is guided by a working group consisting of BC Transit staff, local government staff from the municipalities of Penticton, Osoyoos, Princeton, Summerland, Keremeos, from the Regional District of Okanagan-Similkameen, and also representatives from the operating companies that run buses within the region. The South Okanagan Transit Future Plan is designed to forecast people’s needs, consider planned changes and growth in towns, and also human and environmental health. With this information the plan envisions what a community’s transit network should look like 25 years from now. BC Transit wants to reconfirm with its customers and stakeholders before making planning recommendations to the elected officials who set routes, schedules and service hours. The coming decades will present environmental, economic and social challenges. They also present an opportunity to transform our communities into places that are even healthier and more livable. Building sustainable transportation networks that integrate and promote walking, cycling and transit will be key in realizing that vision. An automobile trip to Princeton and back currently costs something like $10 to $15 in gas, insurance, maintenance, and depreciation. Not to mention that an SUV/4wd would leave a carbon footprint of about 37 pounds. Some people do that drive once a day, sometimes even twice, and in 20 years from now that could be an unaffordable luxury. It does look like perhaps one day there might be a bus to Coalmont. We’ve talked about the cars of Coalmont before. This one is currently parked outside Randy Folk’s house with a for sale sign. Look out quads! Although it’s not street legal, hopefully you won’t see this high-rider on the trail, but you never know. They used to run trains there, and this is really only a “Caddy on a 4×4 frame”. If you’re driving a quad it could certainly be a highly competitive encounter, and will no doubt inspire some insight into the imbalance of power that some trail users feel when they approach something bigger and badder than what they’re currently driving. If you’re a super competitive KVR trail user, or if you just want to buy this to prevent others from being so, here’s you chance. Call Randy at Krankin’ Vintage Restoration, 250-295-6924. You can now tour Coalmont as a virtual tourist – or perhaps you just want to look around the corner without having to go out in the snow. 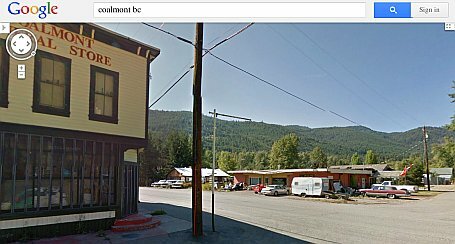 In any case the Google street view camera car has been here and anyone, anywhere in the world, can see what Coalmont looks like from the street. 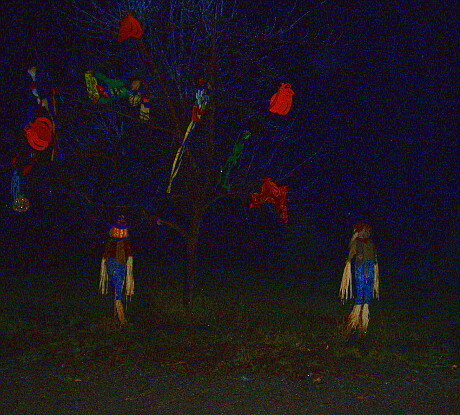 It has just turned 2013, the Magic Tree has been welcoming to all who enter town, and 2012 has been a good year for Coalmont. In a sense, this year has been another anniversary for Coalmont. The General store turned 100 in January, and we’ve had another major town party around the 100th anniversary of the Hotel. The major news for the year is that the Arthon road crews have been working up the hill and some workers are staying at the Hotel and forming a little community within a community there. With a new road built from the mine to the Coquihalla, and a brand new coal crusher installed by crews from England, the mine will be ready to go in the new year under the name of Coalmont Energy Corporation. Other than that, the community association has not imploded, and we survived the Mayan calendar circus, so there is really not a lot to worry about. The weather hasn’t been very cold and we haven’t had a lot of snow, though there’s enough to keep the sledders happy and the town sounds like a hornet’s nest on the weekends.